I did not want to play it safe so I felt I needed a bigger canvas to express a large variety of colors, technique, and whimsy. 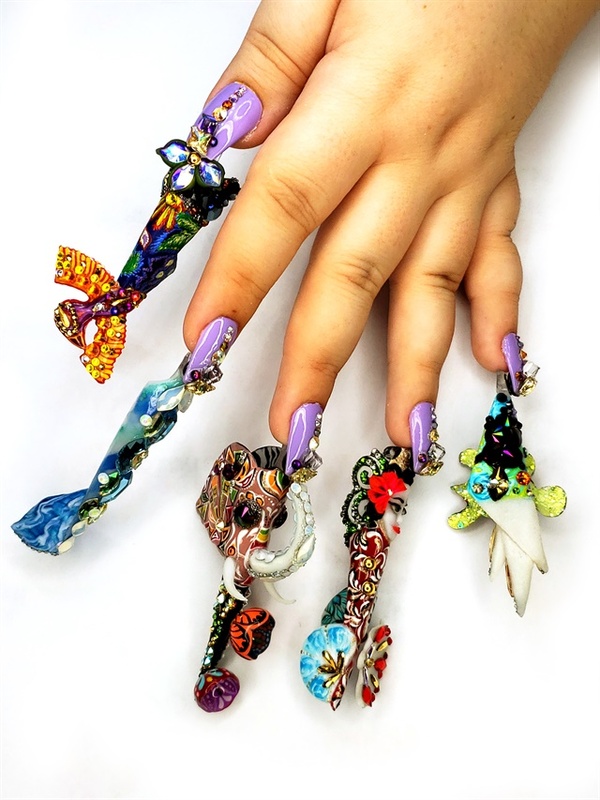 I had this idea of snap-on nail charms that would transform a short and elegant set into a piece of artwork and provide the wow effect I needed. Like a charm bracelet, it could be a fun way for a millennial traveler to remember all the wonderful places visited and cultures experienced. We start the journey in North America. It is very important to feel comfortable when you travel and that is why the set of nails is of a wearable length and shape. I thought that a nice lavender gel color is perfect for early spring and the Swarovski crystals provided by our sponsor would complement the color. I wanted to try something I’ve never done before and got some snaps at a craft store, and attached one side to the underside of the nail with 3-D gel I use for crystal placement and stuck the other piece to the base of my nail charms. The South American nail is shaped like a Mayan Pyramid and the back side is painted accordingly. The top however is inspired by Huichol yarn painting, a very fun and unique art that inspired the spinning bird on top as well. I used glow in the dark acrylic at the base of the nail and covered that with Swarovski skulls and jet black stones, to symbolize deceased ancestors and respect for their heritage. I thought Antarctica would be an exciting place to visit. 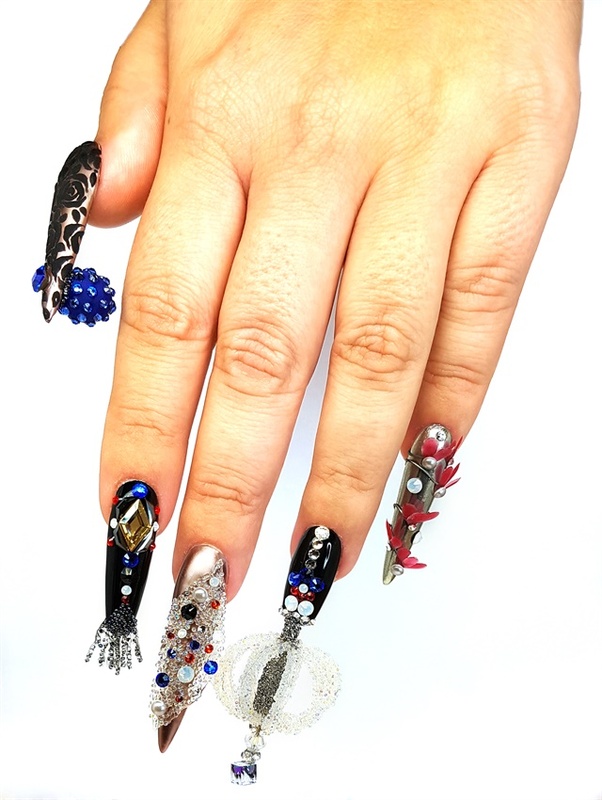 I sculpted the nail with white, blue, turquoise, and glow in the dark acrylic, and encrusted with Swarovski elements. I thought it would be cute to create a little whale tail for the tip and add tiny crystals as well. Africa was so much fun, because I sculpted the actual nail in the shape of an elephant head. The underside of the nail is all zebra stripe, the top is hand painted in an African Art style pattern and topped with Swarovski elements. The nail is topped with two beautiful spinning pieces of African pottery, made from builder gel and painted inside and out. The elephant's trunk glows in the dark and is adorned with opal Swarovski elements. A Geisha doing a traditional dance is the Asian charm. The fan is sculpted out of white and glow in the dark acrylic powder and it spins. I chose red and gold colors because they are very relevant in all Asian cultures and symbolize wealth and good fortune. I made one turtle out of rivoli Swarovski elements and built the spinning one out of builder gel to represent Australia. 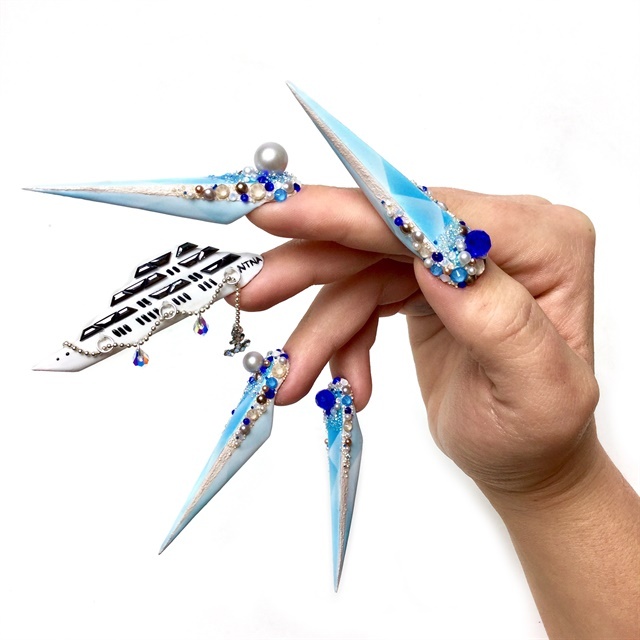 The Sydney Opera House is represented in the tip of the nail, sculpted out of white and glow in the dark acrylic with beautiful Swarovski navette stones and crystal pixie at the underside to show lights in the windows. Click here to watch her video diary. A Wanderlust lifestyle must begin with a camper. It would allow me the luxury and tranquility that home brings while also fulfilling my desire for freedom and adventure at my leisure. This design was created using acrylic sculpted into the shape of the camper. I burnished it with chrome to give it that iconic camper look. The camper is riding into the sunset with Swarovski taillights blazing. The first stop on my adventure would be Rhode Island as that is where Swarovski is located. 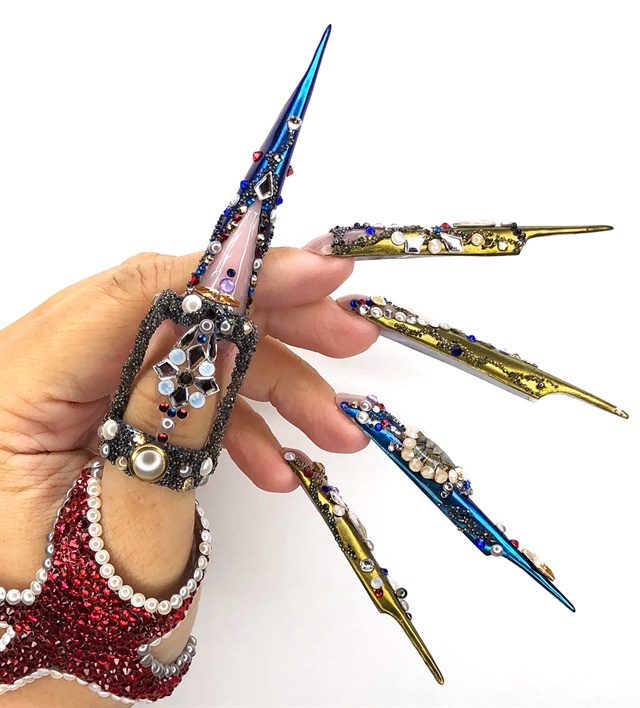 I created this nail in the shape of the Swarovski swan and covered it in lots of sparkly crystals. The swan is resting on a black nail to make the crystals pop. The next stop on my adventure would be Colorado for some snow and skiing. Next up is the Wild West. For this design, I created the Route 66 sign, added a longhorn steer, and a Swarovski destination pin. The final stop on this adventure is California. The West Coast waves, the surf culture, and he sparkling nightlife speak to California tranquility. We travel, we learn, we grow…and find happiness! I chose to do the sub category, culture, because of the vibrant colors and bold patterns. In addition to the color choices in the collection, I loved the opulence of the accessories and the over-the-top statement pieces. I really wanted each piece to not only be cohesive as a set but also be able to be an individual art piece. The bold color choices of the culture collection inspired clean lines and color blocking. I wanted to represent the graphic textile patterns. I also wanted to include a piece that conveyed the bold sculptural element that went into creating this collection. Topping off each design I used Swarovski crystals to add that bold jewelry element. Through the vibrant palette of this collection it really let me be creative in interpreting each look into a wearable piece of art. I was most inspired by the sub-theme Adventure, which is characterized as: solo, raw, powerful, nomadic, and natural. I interpreted the adventure traveler as someone who is down to earth and searching for clarity. For this reason, I created this design to be wearable and to show that there is beauty and originality in simplicity. This type of modern traveler is looking to separate from everyday life and reconnect with nature and themselves. This led me to incorporate geode nails into my design as they are a natural formation, and beneficial in meditation and finding balance. Each geode nail is painted with seven layers of colors — one for each chakra. The accessories consist of timeworn surfaces and offer functionality, so I sculpted nail brooches inspired by aged leather and belt buckles. I also painted bandana nails as they are an accessory not only used for fashion, but to protect one’s self from the elements. The clothing gives an overall Western feel with elements adapted from bohemian fashion. This western bohemian look perfectly captures the merging of East and West which is exactly how I would define Wanderlust, and what I aimed to portray in the overall look of my design. My inspiration for this challenge was the Fine Rocks Tube from Swarovski. This cylindrical shape is perfect for creating the nail design, because it imitates the shape of a nail. The next thing that inspired me was the color of Swarovski Crystal Majestic Blue, associated with the color of the ocean or the wide-open sky. I also made a crystal swan, as its Swarovski’s logo. The sub theme I was drawn to was titled leisure. Leisure is all about being fancy or living the life of luxury. When I thought of traveling and nails around the world, I remembered learning about the Cuban manicure. The Cuban manicure is a style of wearing your nails with the mid-section being painted (not the moon or the tip.) This has transcended into more modern styles where the moon and tip are one color and the mid-section is another. So I decided to create an extreme twist on the Cuban manicure. When researching my theme I found that Swarovski talked about a necklace they made that was interchangeable between being a long necklace and a choker. So I decided to make my nails interchangeable. Keeping in mind my Cuban manicure idea, I made nail plates that sat on the mid-section of my nail only. 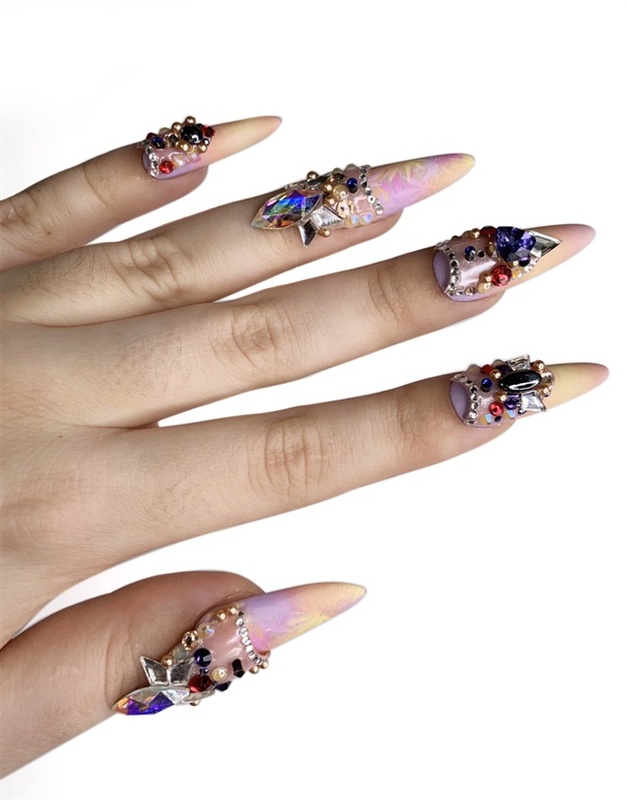 These nail plates allow you to wear an extreme embellished Cuban mani or you can flip them turning them into a finger cuff and revealing relaxing silhouettes of sunsets and palm trees. These nails are not for the working girl. They are meant for someone who lives an extreme lifestyle; someone who can afford to sit at the beach all day and drink cocktails. To fit more into the leisure theme I made sure I used tons of pearls and built my crystals in floral formations. I made my nail plates pink pearl chrome to contrast with the matte finished design underneath. To have wanderlust, you have the desire to travel, experience new places, as well as reconnect with your surroundings, refocus your mind, body and soul, and disconnect from the chaotic life we all tend to live. I was so excited to get this challenge because I have always loved to travel and experience new places. We were given four sub-themes for this challenge: Adventure, Leisure, Culture, and then Freedom, which is the theme I chose to create. Freedom is inspired by the carefree and let loose nature of the surf and skate culture, especially from the 1970s. Balance, ease, and free-flow are some of the words Swarovski used to describe their take for this theme. 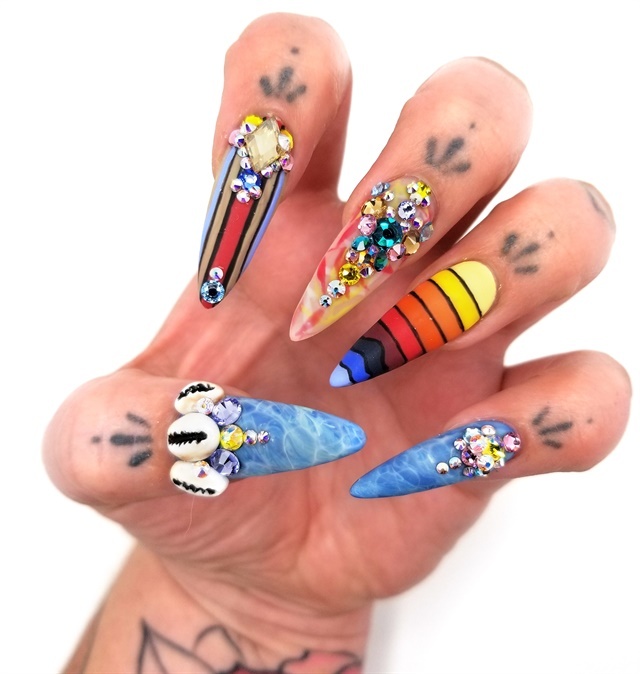 So with that, I wanted to create a set of nails that made you feel like you were at the beach, sitting on a surf board with the sun beaming down and a gentle breeze blowing through the palm trees. I painted a surf board-inspired nail to tie in the freedom of riding the waves, and a palm tree leaf design to incorporate the trees blowing in the breeze along the beach. The "sunset" design was inspired by the free flow cottons and fun designs worn on graphic T-shirts. I painted two of the nails with a water/wave design, inspired by the clear blue water. Bright colors, different hues of blue Swarovski crystals, and handmade puka shells were used to create necklace-inspired designs to showcase the jewelry worn for this collection. I kept the colors bright and bold to highlight the more modern take on the 1970s surf era. I found my inspiration in the Swarovski Wanderlust sub trend, Leisure. The beachy colors and the theme spoke to me and gave me the feeling of yachting in modern luxury. I sculpted all of the nails to have facets like crystals. For the yacht nail I chose a stiletto edge shape and made a facet on top. You’re on board the world’s most expensive yacht, which features windows made of Swarovski, Swarovski fenders, and even a Swarovski anchor. Pull anchor at your next destination, Crystal Pier, the exclusive and private vacation spot for only the very wealthy and super elite. At Crystal Pier, the water shines like crystals and the pier is made entirely of Swarovski. Wanderlust. Freedom, tranquility, adventure, connections, and experiences. What isn't to love? However, when it came to this challenge, I was at a bit of a loss for which direction to take. Thankfully I was due to head out of town for a two day nail class with some fabulous nail friends. By the time I was back in my studio, I had more inspiration than a client on Pinterest. I decided to very loosely base my design around the sub-theme Freedom, falling in love with the relaxed, beachy, free-spirited vibe. I wanted to showcase different techniques across all five nails, and for the set to incorporate moving elements. I enjoyed using a few mixed-media to create my set, really loving how the friendship bracelet nail came out. I've learned a lot from this challenge both professionally and personally. For example, I now have an even stronger desire to travel... did someone say Orlando? When researching the spring and summer 2019 Wanderlust collection from Swarovski, there was a lot of reference to traveling, the ocean, and nautical themes. Focusing specifically on the trend Leisure, which had further reference to the ocean, the use of pearls had a strong focus as a natural element, which was an interesting change from the typical faceted crystals one thinks of when Swarovski comes to mind. 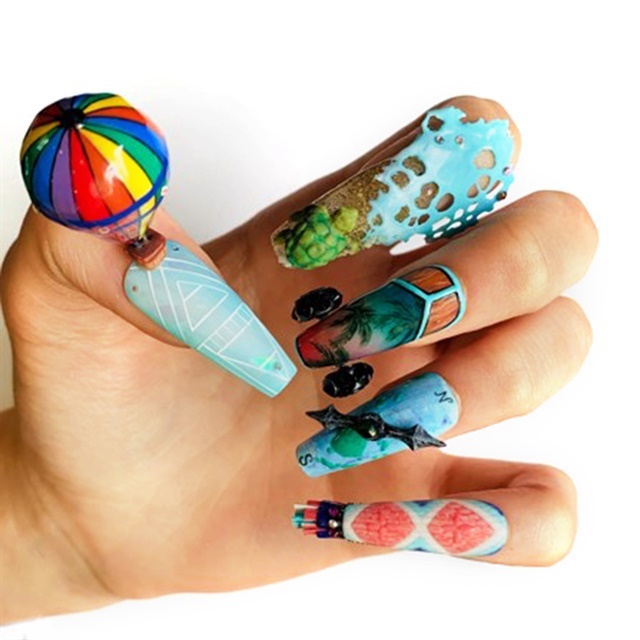 Using both sculpted hard gel and nail tips, the goal was to create a final look that guides viewer’s eyes in a circular motion, like the curl of a breaking wave. 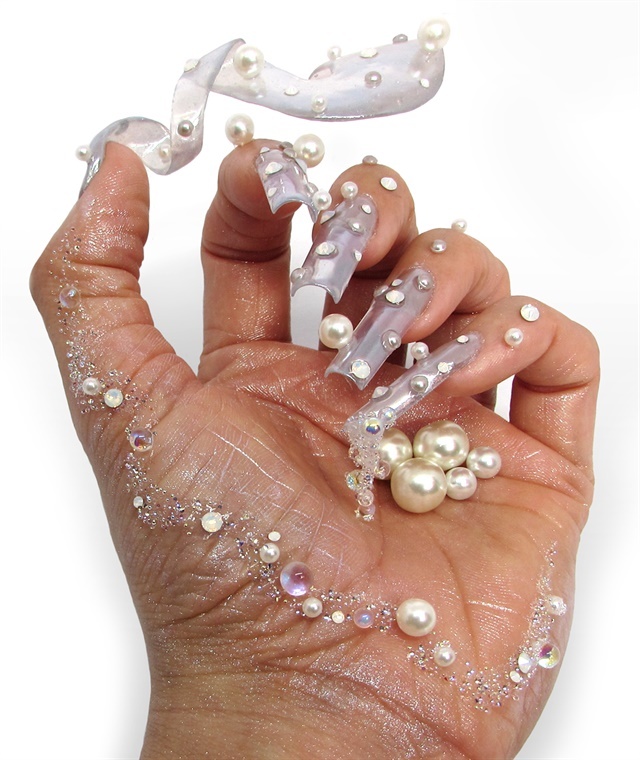 Pearl pigments burnished into the nails and skin adds glamour and sheen, and the use of Swarovski Pearls studded throughout the manicure adds a playful aspect. Swarovski Crystal Pixie adds the tiny details of the bubbles found in sea foam. 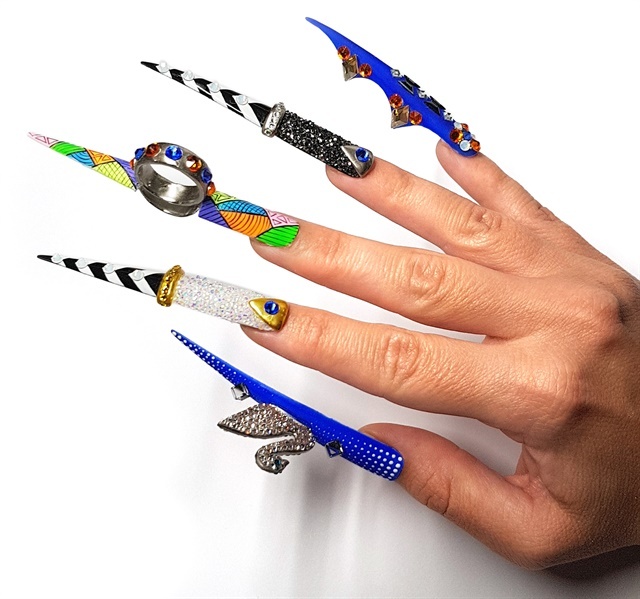 These nails give the effect of the movement of ocean waves, specifically inspired by the fluid shape of the spiraling earrings worn by a model in Swarovski’s Leisure look book, and used as the shape for the feature thumb nail. This look is clean and uncluttered, with only simple details, to correspond with Wanderlust’s “Desire for experience over things” and a “feeling of freedom.” Additional inspiration comes from Eichi Matsunaga’s work for Wanderlust, and his placement of crystals onto the skin as embellishments. This look is not only about the nails specifically, but the whole hand. The posing of the hand represents a clamshell, with pearls clutched in the center of the palm. 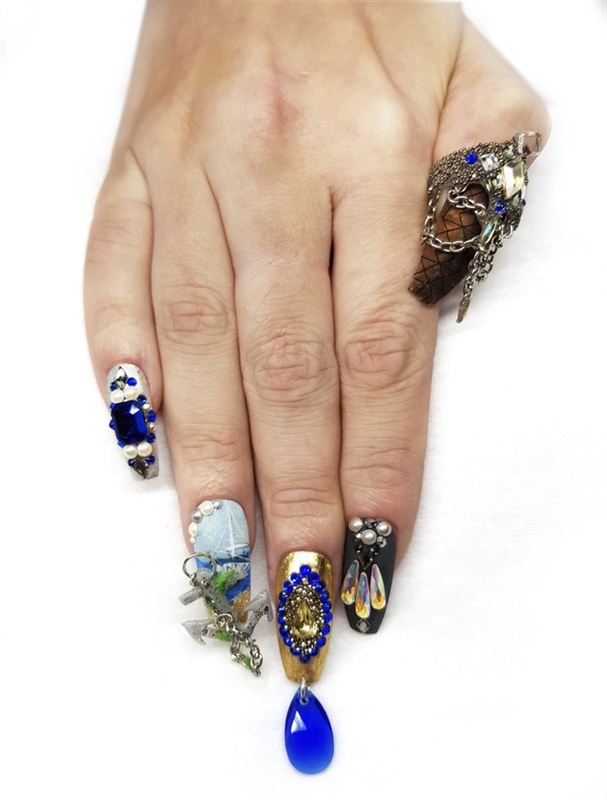 Perhaps this hand belongs to the goddess Venus, as she was depicted in the famous painting by Botticelli, “The Birth Of Venus.” With all of these elements brought together as a whole, this look captures the leisurely feeling of Wanderlust. I was intrigued by all of Swarovski’s sub themes, however I really wanted to push myself by choosing a color palette that I don’t typically gravitate toward. I really enjoyed expanding my horizons. Although, in the innovations brochure, leisure is said to be an emblem of barefoot luxury, the pictures and descriptions still spoke to me as poised, refined, and sophisticated. I wanted a sleek shape that reminded you of a yacht, accompanied with sea-inspired accents, detachable nail art, and a bejeweled surface. Like the ocean, I let my design evolve and flow like the forever cascading waves. I hope this set indulges your leisurely wanderlust. I started with my research. I used Swarovski ’s official page, YouTube, and Google to find more details. One of my strongest skills is 3-D and 4-D designs, so I was looking for some extreme inspiration. I studied the sub-themes and I liked leisure the best. 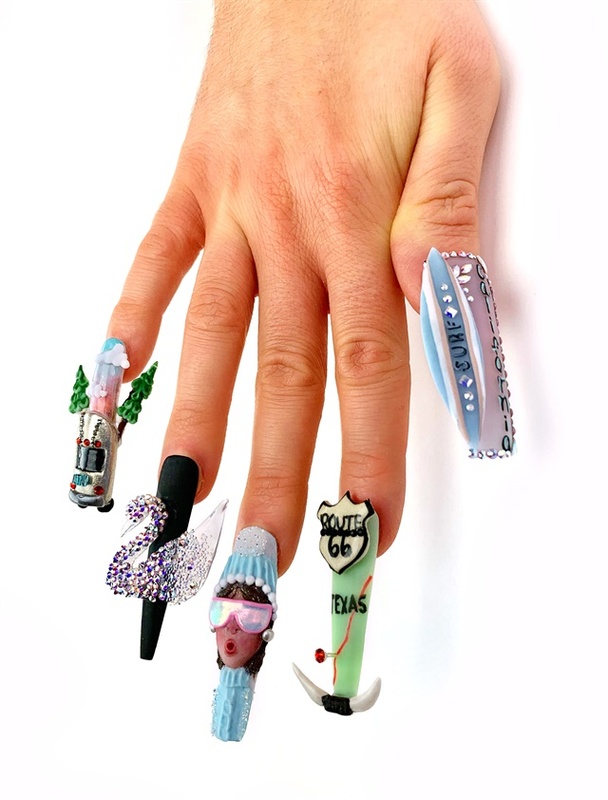 I’m working in the center of London, I can see the very wealthy people’s life every day, it was a great opportunity to try the lifestyle even if it was just nail art. I found an article with the designers who collaborated with Swarovski, so I was looking for inspirations from the Spring/Summer 2019 fashion shows. The leisure sub-theme features are sleek, sophisticated, monochrome, simple style with floral highlights, light, floaty, velvet materials, and oversized accessories. I found the work of two designers really inspiring, and I tried to transplant that into the leisure category. I made my design sophisticated, reflecting the super-elite life, the poolside glamour, and floaty, elegant kaftan style design. I liked the oversized jewelry idea, so I made a huge, glowing nail jewel with acrylic and Swarovski crystals, and Pixies on the ring finger. I used the monochrome style colors to keep the design in the luxury image, but I also used maritime style colors to represent the life on the ocean waves. For my chosen look, I decided to focus on freedom. That particular style and theme really spoke to me and it's the one that got me really thinking about what I could create. I really wanted to focus on a sparkling rainbow of youthful bright colors and crystals for my palette. While I chose my main color focus of the palette as a range of brilliant, mint blues and lime that reflects clear waters and open skies. I was really drawn into some of the small ‘charm-like’ details in some of the inspiration pictures and also the multilayered jewelry featuring chains and bead work. 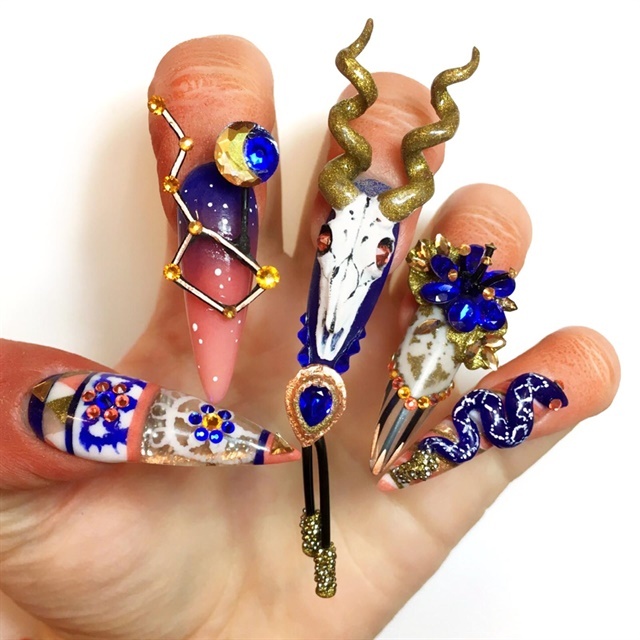 I wanted to create beautiful Talisman charms and statement pieces that felt sprawled across each nail and basked in all of their glory. To really put focus on the these statement pieces I kept the base quite simple focusing on the blue ocean and skyie, with one nail being the main attraction with its bold, crisp lines, representing casual vibes and simplicity. The charms I created were quite laid back and free-floating, consisting of ‘slogan’ graphics in the word ‘surf’ on my clear acrylic charm. 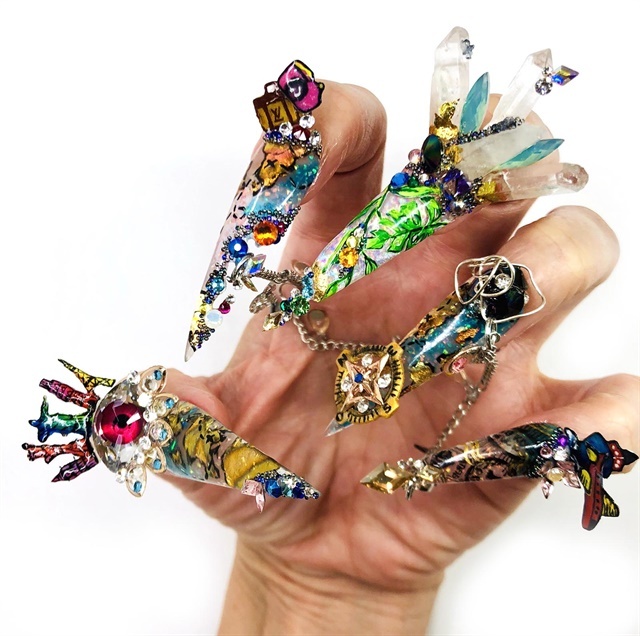 The crystal details on each of my charms and nails provided the whole set with an abundance of decoration and a sense of radiance and beauty. I wanted to take inspiration for surf and skate culture which is why I focused on the blue hues and added the text ‘surf’ int my piece. I didn't want to make the theme too obvious, but definitely wanted it to be represented literally within my piece. 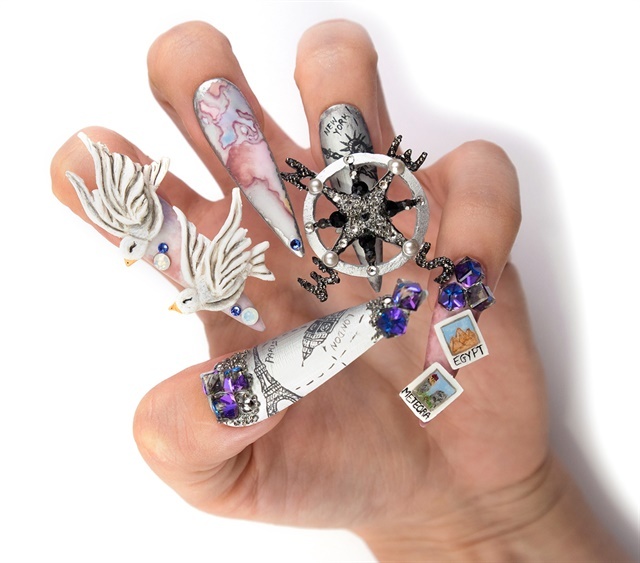 I didn’t overspill or go overboard with 3-D work and embellishments, as I wanted to keep the nails looking like a ‘breath of fresh air’ as this theme of freedom also focused on only the bare necessities being required. The most important thing I've learned from NTNA is that no matter where we are from, we are all in this journey together. Thank you Nails Magazine and Swarovski for bringing out the Wanderlust inside all of us. 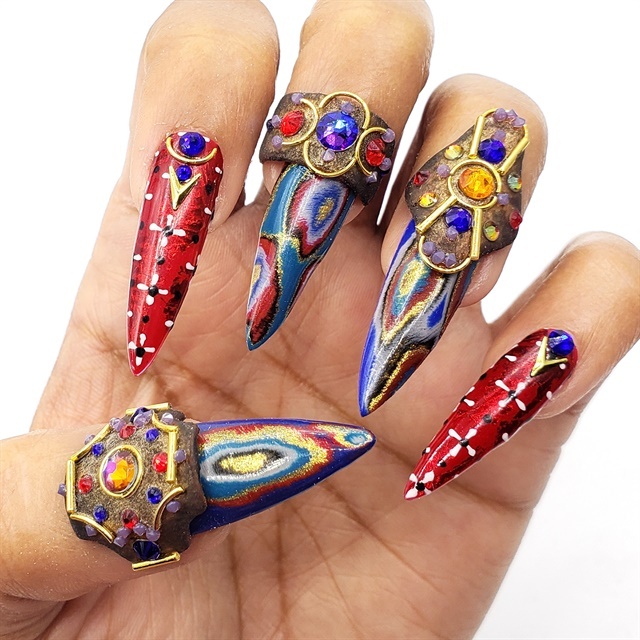 I wanted to create a unique set of nails as the symbol of our world. 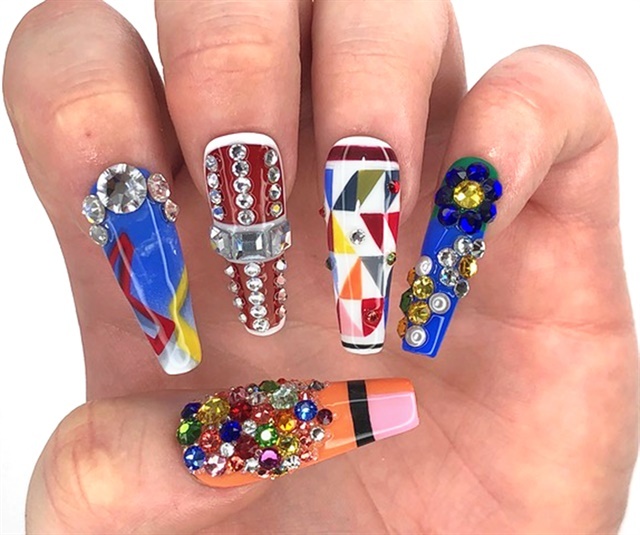 Each nail highlights a country from one of our Top 18 Finalists for Season 6. I hope to travel and meet some of our great nails artists of the world! Thumb: Landmarks that I have visited. The All Seeing Eye reminds me there is beauty hidden everywhere, and all we need to do is look. The theme Wanderlust and its corresponding look book had so many fantastic key words, textures, patterns, and colors that choosing a starting point was incredibly hard. I eventually settled on the sub-theme Adventure because I was won over by the stunning color palette that featured my all-time favorite Swarovski color, Padparadscha, alongside earthy tones such as Topaz and Ivory Cream, which looked particularly effective when featured alongside the new Majestic Blue. Key elements such as ‘desert skies’ and ‘timeworn surfaces’ conjured up images of a nomadic traveler making their way across a red sandy desert under the brilliant blue sky. I wanted my nail design to tell the story of my solo traveler and present the unique shapes, colors, and structures they would discover along the way. I like balance, so I chose elements that mirrored one another and tied in with my color scheme, for instance the bright blue of the Desert Bluebell matching the blue of the sky above or the twisted structure of the antelope horns matching the twisted body of the snake. I believe that having a strong color scheme helped me stay true to the theme in a way that was aesthetically pleasing and translated well into a nail design. When it comes to my daily nail clients I tend to rely on gel paint to create artwork, so I wanted to use this opportunity to challenge myself to use different elements such as larger crystals, wire, metal leaf, and colored acrylic as the sharp precision of color-blocking is not something that comes naturally to me. I am happy with my design and pleased that I pushed myself out of my comfort zone. Leisure is a sub-theme that involves contemporary silhouettes and a maritime theme, which also incorporates monochrome shades and pearls. This shows that’s it’s no longer only for the wealthy. I covered three nails in foils to represent three precious metals: bronze, gold, and silver. The bronzed has been given a distressed look to incorporate the natural weathering that the sea provides. On the thumb nail I made a detachable ring encrusted in crystals which is not only a nail charm for the thumb, but can also be worn as a stand-alone piece of jewelry, which I feel gives perspective of indulgence. The pointer fingernail is a chandelier that can be found on board the yacht. I did this to show luxury, as Swarovski says that the leisure trend can also be found in luxury interiors. 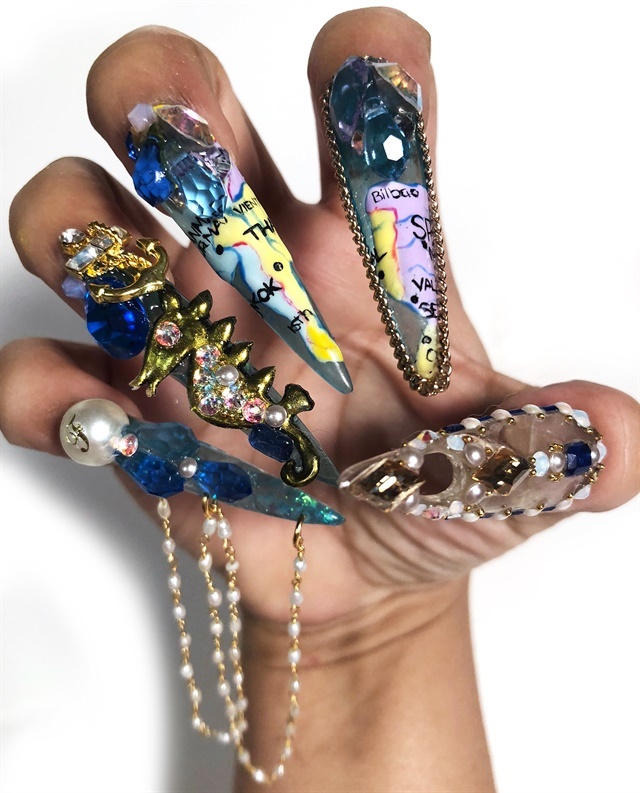 On the middle finger I did a design using Crystal Pixie, which gives the impression of the sea floor surrounded by other crystals to represent the treasures that can be found there. I have added a teardrop Swarovski Crystal, which simulates a drop in the ocean. In keeping with the maritime theme, I included an anchor which is attached to the nail using a chain and a magnet to hold it onto the nail. I did this so it can be removed so you can pull anchor and set sail. I hand painted a sea-inspired mural on the nail behind where the anchor is positioned, and painted a personalized yacht to show individuality and bespoke characteristics. The silver nail has monochrome accents to create contemporary silhouettes and adds fluid shapes while still being stylish. Pearls have been added to my design to add an extra touch of elegance. This design I have created shows how this type of leisure is evolving and becoming more stylish. Travelling allows you to express the way you feel leaving behind your daily routine. I sculpted 3-D doves to represent freedom. There is a whole world out there waiting for you to explore! All you need is a map and a compass to guide you through your journey. And that is exactly what the next two nails are all about. I zoomed out from my spot on the world map and drew this piece of the world with gel-polish aquarelle technique. I sculpted the compass base with acrylic using the NTNA mat as my circle guide and an E-file for the holes. I applied crystals to make my compass look like a jewel. I wanted my compass to be able to move so I made a hole with an E-file and I attached a shaft with a small gear so I can rotate the compass from behind without actually touching it. New York is my dream destination that's why I hand painted the Statue of Liberty as a base for the compass. After each journey you return to everyday reality renewed and full of sweet memories which you cherish for the rest of your life. This is why I sculpted 3-D polaroid photos to keep the memories alive. Once you start travelling and exploring the world you keep wanting more and more. So you start planning your next destination. These destinations could be romantic Paris or cultured London. Leisure stood out the most to me. It’s my ambition to do more editorial work and I saw this as my opportunity to tackle such a challenge. Being asked to interpret the trends Swarovski has set forth is the exact opportunity to create something I’d love to see in print or worn on a runway. Not only is leisure something that appeals to me, the way it was described is what urged me to choose this theme. Invoking luxury and opalescence on nails to reflect my theme was so much fun with all the different hues from my chosen palette. The ocean’s beauty is reflected in the different crystals I chose to represent those waves. To create this set I went with a mariner theme, hand drawing a map to get me to my next adventure. Encapsulated glitter was placed under the translucent blue jelly shade to give those waves some sparkle. Pearl chains and other treasures were added to the nails to represent all the keepsakes one might acquire on their adventures. A golden seahorse with chrome effect was added for a touch of whimsy while still being decadent. The new patterns from Swarovski lend themselves well for creating dazzling geometric patterns. 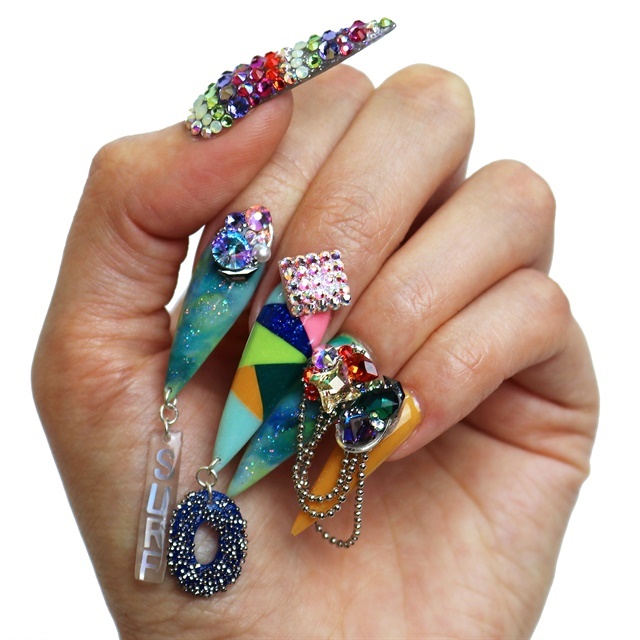 The nail shape was kept sleek and sophisticated to keep the attention on the crystals. My nails had to have a cutout surrounded by crystals just like the fashion worn for this theme. Nails are an accessory and therefore needed to be larger than life to show off high end stones and keep in line with this life of luxury. Time is the ultimate luxury and nothing says you’ve got time like a pair of killer stilettos with ultra-embellished nail art. See the 24 entries from Pre-Challenge #1 here.